As usual, there were a lot of PowerBooks at this conference. Interestingly, Esther Dyson, Lawrence Lessig, Bruce Sterling and I were the only people I noticed who had stickers on our PowerBooks. Other people who I know who have stickers on their PowerBooks are Mena Trott and Cory Doctorow. I wonder what this means? What do those of us who are willing to vandalize our pristine PowerBooks with stickers have in common? Maybe you're the only ones who actually "own" your Powerbooks? I would, if it weren't property of the company, and if I weren't afraid the sticker would come off eventually and I'd be left with a sticky cover. My boss owns it, but they're pretty hands off and haven't commented on it yet. Maybe what you all have in common is that you're not too concerned about your Powerbooks' resale value :-)? I've always had sitckers on my powerbooks. but I've always had stickers on everything. Skateboards, Record holders, etc - however I don't have any on my new laptop - just haven't found the right one yet. Just get some Goo Gone to remove the stickers before you sell it or give it back to the boss. I have no idea how it works but its gotten stickers off of everything I've tried it on. One reason could be to tell the difference between powerbooks at events with a high powerbook to PC notebook ratio. I bought a Dell snap-on for my latest notebook that changes the color for my latest notebook because everyone else in the company has Dells. There's a sticker on my notebook (not a Powerbook) because of the time the guy ahead of me at airport security had exactly the same model Dell - and after putting our shoes back on, we wound up picking up each other's notebooks. Not a pleasant discovery in the hotel room halfway across the country that evening. There's stickers on my 8 year old computer monitor (which is still going strong). Looks great. so where are the pictures of stickers on laptopts then?? My Powerbook is less than a week old...nothing gets stuck on it until the 'pristine' novelty has worn off. Well, it is a design piece. Don't mess with the design. Keep on bloggin'. Have a nice packet. Baby on motherboard. So if you join that Flickr group, how do you actually add your photo to the group photo pool? It sure isn't intuitive. hey Dav, you have to join the group and then open up the 'organizr' - you can then simply drag and drop your images onto the right group. hth. 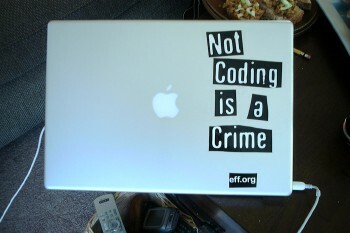 In my opinion it's even more interesting, why so many PC-Laptops don't have stickers neither. Usually their designers know nothing about shape and grip and thus they can only get nicer with just anything on top. I put mine on my iBook after my friend recommended it for a very practical reason: it's supposed to reduce the chances of theft. Preferred spot for laptop stickers? Well, The votes are tallied Joi. You may not like the results but while some including myself would like to think that we put stickers on powerbooks because we are "creative" or perhaps because we see them not as simply an object unto themselves but love them as a "means to an end"... The truth is the predominent reason is because the sticker putter on'rs are "rich f-ckers" and everyone else is to worried about how much they paid or how much they can get upon resale / upgrade to go and defacing their really expensive toys by slapping stickers on them. Hey, if you don't like the answer then don't ask the question. Ha! This is all in good jest. A little razzing. BTW, I think i saw an interview with John Perry Barlow on Tech TV once upon a time and if my memory serves correctly he too was one powerbook toting sticker puttin' dude also. Gee, I wish I had that interview. Anyone? Abe, really there are three types of stickers. The ones that put stickers somewhere, the ones who put them over the glowing logo and the ones like me who take the top metal plate off and put the sticker underneath the glowing logo. Something black esp. looks good in the dark with the light from the LCD glowing behind it. Jesse Vincent stickers his Powerbook so he can spot it in a crowd. He's had one too many walk off at a conference and not been able to identify it by sight. i don't have any stickers on my laptop, which is not a powerbook. BUT I HAVE A REALL COOL BURN MARK. yes, i did light my laptop on fire. I heard that if you do not want to get all the sticker goo on your laptop yet still have stickers on them, then to just put some adhesive cover on it. Frisket Film would do it. You need to look for the type that best fits your needs though. i now plan on putting a "japanese hacker" or "mac pirate" sticker on my 12" powerbook to hide a small dent caused by a dropped cell phone. at least this will ad character/style rather than an ugly dent. Listed below are links to blogs that reference this entry: Stickers on our PowerBooks. Joi Ito - "Stickers on our PowerBooks" by Joi Ito is licensed under a Creative Commons Attribution 4.0 International License.